Respiratory Therapists possess the knowledge, skills and abilities to provide a comprehensive range of therapeutic and diagnostic procedures to patients requiring basic and advanced cardiopulmonary services. 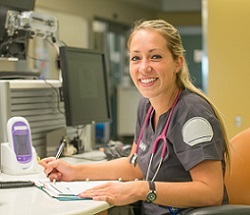 In Alberta, Respiratory Therapists receive their education based on the National Competency Profile in fully accredited three-year education programs at SAIT Polytechnic in Calgary and NAIT in Edmonton. For further information regarding the skills and duties of Respiratory Therapists, please click here.